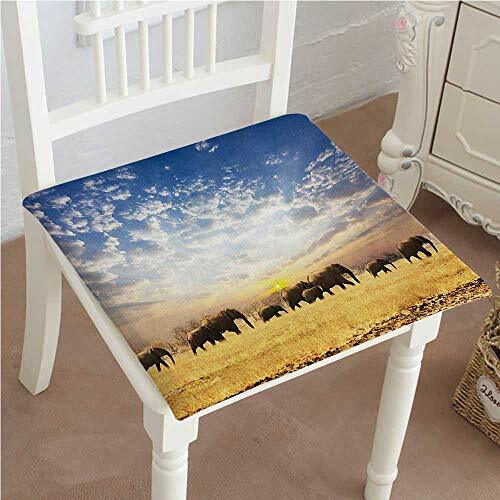 Mikihome Classic Decorative Chair pad Seat Collection Elephants African Wild Animals Golden Colored Desert at Sunrise Scenery Picture Blue Cushion with Memory Filling 22''x22''x2pcs by Mikihome at Animal Backgrounds. MPN: YZD-15-0823-03039K55xG55x2pcs. Hurry! Limited time offer. Offer valid only while supplies last. Waterproof seat protectors are made of durable eco-friendly polyester pongee protect your car seat, chairs, house, etc from dirt and spills.